Main saare zamaane ke gham ki dawaa hoon. It is now over two decades since the Hindi-film heroine drove the vamp into extinction, and even longer since the silver screen was ignited by the true Bollywood version of a cabaret. 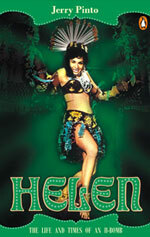 Yet, Helen—nicknamed ‘H-Bomb’ at the height of her career—continues to rule the popular imagination. Improbably, for a dancer and a vamp, she has become an icon. Jerry Pinto’s gloriously readable book is a study of the phenomenon that was Helen: Why did a refugee of French-Burmese parentage succeed as wildly as she did in Bollywood? How could otherwise conservative families sit through, and even enjoy, her ‘cabarets’? What made Helen ‘the desire that you need not be embarrassed about feeling’? How did she manage the unimaginable: vamp three generations of men on screen? Equally, the book is a wonderfully witty and provocative examination of middle-class Indian morality; the politics of religion, gender and sexuality in popular culture; and the importance of the song, the item-number and the wayward woman in Hindi cinema.